Halfway Around The World, Brexit Hits Japan's Already Soft Economy : Parallels The world's third largest economy is still struggling to gain traction under Prime Minister Shinzo Abe. The British decision to leave the European Union has delivered another blow. 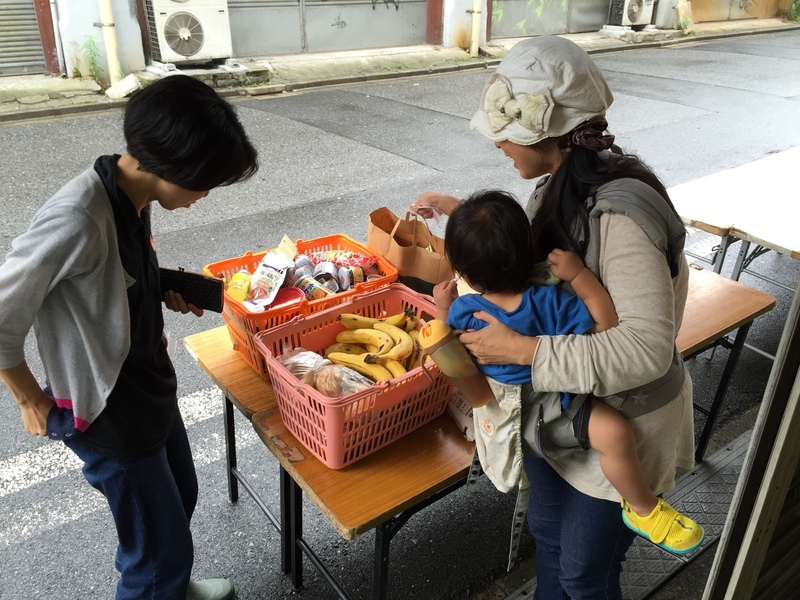 A Japanese mother and her 2-year-old pick up free groceries in Tokyo at the charity Second Harvest. Japan has a limited safety net for the poor and the economy is still struggling to gain traction under Prime Minister Shinzo Abe. In Japan, the world's third largest economy, the Brexit means more bad news for a country already struggling with its finances. Following the British vote to leave the European Union, the Japanese stock market on Friday saw the largest single day drop since the year 2000 (though it did rebound a bit on Monday). Japan's exports instantly became pricier — and less competitive — as the value of the Japanese yen soared. Japanese households, meanwhile, are still cautious about spending money needed that could help energize the economy. "We need to take all possible measures to prevent this [Brexit] from affecting the Japanese economy," Prime Minister Shinzo Abe said at a news conference Monday. He didn't signal which measures Japan would take. It's dismal timing for Abe, who was elected in 2012 on an eponymous plan and promise — "Abenomics" — to revive the Japanese economy after years of stagnation. But the country faces stubborn headwinds: an aging and shrinking population, and climbing public debt. "Three and half years on, the metrics are pretty dismal at this point, for Abenomics," said William Pesek, executive editor of Barron's Asia and the author of Japanization: What The World Can Learn From Japan's Lost Decades. "The metrics initially were measured by the stock markets rising, by exports increasing and the hopes that companies would be increasing wages. We haven't seen that part of it, and it's kind of the problem." A standard basket of donated food that's available for pickup once a month for Japanese families in need, from the non-profit food bank Second Harvest. Feeling the pinch more than most are part-time workers, who don't get the guarantees of wages and benefits that full-time jobs offer. One Thursday a month, dozens of working-class Japanese line up under a train overpass to pick up a free basket of food. 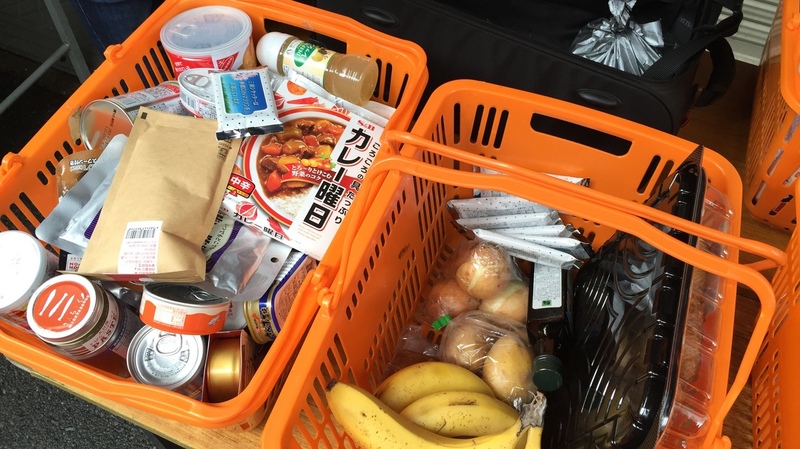 "Seaweed, tea, sauce, biscuits in a can, emergency-type food," Michiko Sato shows us, as she digs through her basket. "And dry curry." It's made possible by the Second Harvest, a non-profit national food bank. The government here doesn't provide much in the way of help for the working poor, since companies have traditionally employed people for life. Since that's changing, the stress of a bad economy has hit non-corporate employees like Sato especially hard. "I feel like that's one of the biggest problems.There's only temporary jobs available to people like me," Sato says. She's working two of them — one as a cashier, and the other checking people into a gym. But it's not enough to feed her teenage son, and there are few places to turn for help. "There's not a safety net here for people in need," says Charles McJilton, the founder and head of Second Harvest. "And the non-profit sector here is still very, very small. I would easily say it's less developed than the Philippines, less developed than India." This leaves a whole segment of the Japanese population struggling to make ends meet. Many of them are single moms and children. Government statistics show 55 percent of single-parent households — most headed by women — live in poverty, defined in Japan as those with no more than about $9,900 in disposable income a year. That's one of the highest such rates in the developed world. "Over time, it's become very difficult with this government to keep up with this problem and this trend," Pesek says. The mothers at the food bank pickup say they don't have time to consider the geopolitics involved. They just want to reliably feed their families. Will More Day Care Help Boost Japan's Sluggish Economy? Tomomi, a 34-year-old mother who didn't want to share her full name because of the shame attached to poverty here, takes the subway from an hour outside Tokyo, with her 2-year-old strapped to her hip and dragging a suitcase to hold the food. "The fact that we can come here and get good food, for free, at least once a month makes a huge difference in our ability to just get by as a family," Tomomi says. To help families get by, Japan did recently delay a planned increase in sales taxes, which would have hit the working poor harder than others. "But they can't do that forever, because ultimately, Japan has a very large debt," said U.S. Treasury Secretary Jacob Lew, when asked about the state of Abenomics last month. "They can defer bringing those taxes into place, but they need to use the space they create to put structural reforms into place at the same time." Structural reform includes ideas like encouraging entrepreneurship, loosening immigration restrictions and getting more women in the workforce. But doing those things to alter the structural makeup of Japan's economy is an arrow that hasn't quite flown. "I would give it maybe a kind D minus, frankly," says Pesek. Jake Adelstein and Mari Yamamoto contributed to this story. For a behind-the-scenes look at reporting from Tokyo, check out our East Asia blog, Elise Goes East.